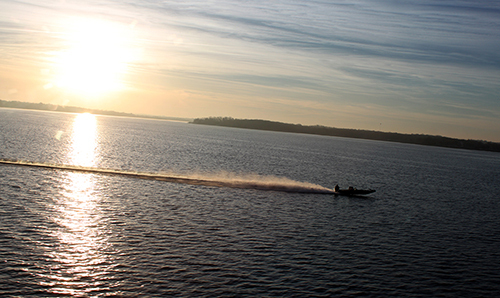 Over the last several years, it has become common for Grand Lake to be listed among the best fisheries in the nation. Angling opportunities … A competitor heads across the early morning waters of Grand Lake during the 2016 Bassmaster Classic. The lake’s reputation for bass fishing success was reinforced in recent weeks in Bassmaster magazine. That streak held true again earlier this month when Bassmaster magazine released its annual list of the “100 best bass lakes in America” and, coming in at 13th in the Central United States, was a familiar name: Grand Lake. In fact, since 2012, the lake has always held pretty steady somewhere in the top 20. According to the magazine, the process to rank the nation’s best bass fisheries takes several months. Yearly data from fisheries agencies and tournament results from all across the country are collected, compiled and discussed by a panel of fishing industry experts that eventually settles on the final rankings. As a two-time host of the prestigious Bassmaster Classic as well as many other tournaments on an annual basis, Grand Lake’s reputation among anglers was already strong. However, that reputation was not built on its own. Instead, it has taken several years of work, education/outreach efforts and of course, plenty of cooperation with area anglers and other agencies that also care for the waters of Grand Lake. It all adds up to annual recognition for special lake that has been welcoming anglers, boaters, swimmers, sailors and visitors of all kinds since 1940. For GRDA those efforts continue on. Ongoing water quality monitoring, shoreline cleanups efforts (including the new Adopt the Shoreline Program) and Rush for Brush are just some of the ways GRDA is committed to caring not only for the fisheries but also for the waters all along the Grand River watershed. Being a good steward of the natural resources under its control is an ongoing GRDA mission. Headquartered in Vinita, GRDA is Oklahoma’s state-owned electric utility; fully funded by revenues from electric and water sales instead of taxes. Each day, GRDA strives to be an “Oklahoma agency of excellence” by focusing on the 5 E’s: employees, electricity, economic development, environmental stewardship, and efficiency.